Elizabeth Wescombe and Diane Gamble are local historians specialising in researching and recording cemetery sites across the Riverina, and they have donated copies of their valuable and unique work to the local studies collection at Wagga City Library. Elizabeth started researching her own family history and branched out from there to help others with their research. As part of her family history work, Elizabeth visited grave sites and at one site they visited, the stone had so badly deteriorated that she got the idea of photographing the grave stones mainly to preserve an image of the headstone as many obscure or remote gravestones are in danger from the effects of time and weather, and if not recorded, this information is lost forever. As part of the process Elizabeth and Diane started collecting obituaries and other information. Elizabeth and her co - researcher Diane Gamble follow a procedure for photographing and researching gravestones and for researching the obituaries, so their work is well organised, clear and methodical. 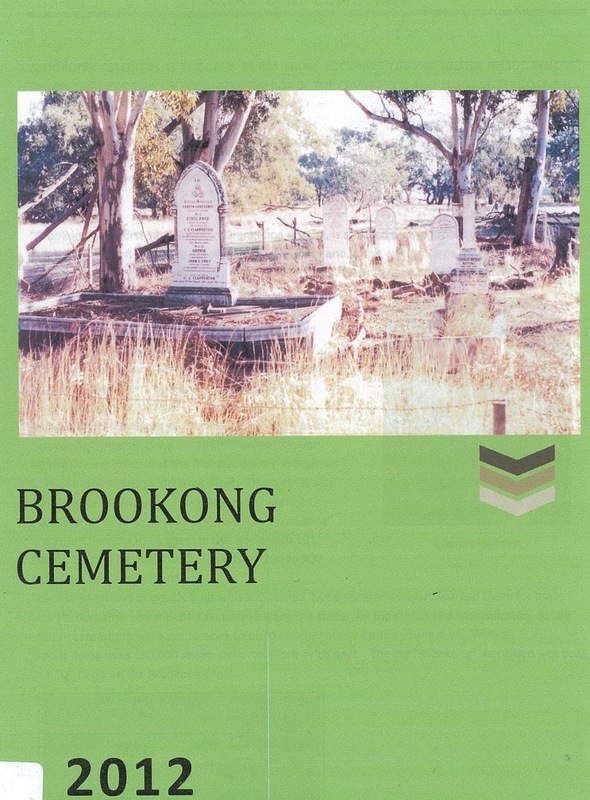 This research is then produced as books ( Brookong Cemetery is illustrated here ) which are now available to view in Wagga City Library. This is an ongoing project so so if you have any information on remote or isolated gravestones or graves that you feel should be recorded , drop me a line via wagga.local.studies@gmail.com and I will pass on your details.